So last week I was hanging around the library administration offices waiting to talk to someone when Randy received the news that one of the arranged speakers for this forum would not be able to attend. He came out of his office, saw me and told me he had always wanted me to speak about fostering creativity and innovation in libraries. I was not quick enough, or creative enough, to come up with an excuse to get out of it. Given my apparent lack of creativity, you may want to take everything I have to say today with a grain of salt. My first question upon receiving this speaking assignment was, “What do librarians need to know about creativity?” When I hear the word creativity, the first thing I think about is the Arts. Painters, sculptors, writers, and dancers are all obvious candidates for needing to regularly employ creativity in their work. Librarians are not exactly at the top of anyones list of creative individuals. However, creativity is simply the ability to bring two previously unrelated thoughts together to create something new. Defined this way, it is easy to see how essential creativity is in a librarian’s work. Especially in these trying economic times. There is another, more fundamental, reason that I feel creativity is essential to the survival of libraries in the future. 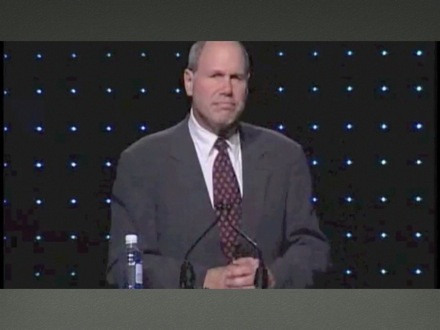 Does anybody here know who Michael Eisner is? He is the former head of the Walt Disney Corporation and he really saved them during a period of time when they were not having much success. Eisner tells a story about why creativity is important that I would like to show you a quick clip of if I could. It is my opinion that librarians are riding a lot of dead horses these days. For example, why do we continue to pay for the same content twice - once in print and once electronically? Why do we bother to check for duplicate call numbers? The patron knows what book she is looking for once she has a call number so it won’t be confusing to her if she finds two books with the same call number on the spine. Or perhaps more radically, why do we still bother with call numbers at all? Why not just assign everything an accession number and let serendipitous discovery and leisurely browsing happen in the electronic catalog rather than the shelves. Those dead horses, however, are for another presentation. The point I am trying to make is that we must be creative if we are going to ditch these dead horses in time to save libraries. If we wait too long, university administrators will begin to see libraries as dead horses. So the question is, how do we foster this creativity in others? 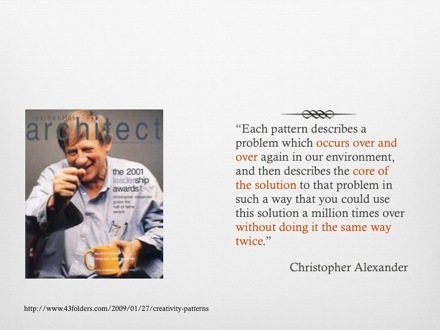 The answer, at least partially, comes from the fairly recent idea of design patterns. Before I go on, I need to know, does anyone know what a design pattern is or are there any design pattern experts here today? Good, because I am probably going to butcher this. You’ll be none the wiser. Here is my simplistic understanding of what a design pattern is. 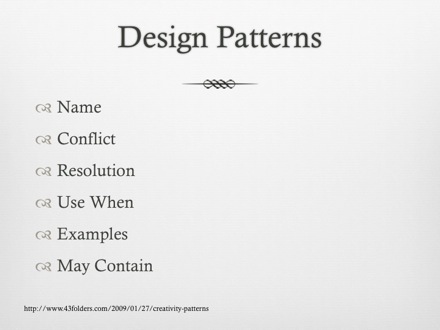 Many of you probably use design patterns every day and don’t realize it. Here’s one I use everyday as a parent. Merlin Mann calls this his “You Pick” design pattern. Should we wear our red jammies or our teddy bear jammies? Do you want a quick bath or a long bath? Do you want broccoli or spinach with your dinner? 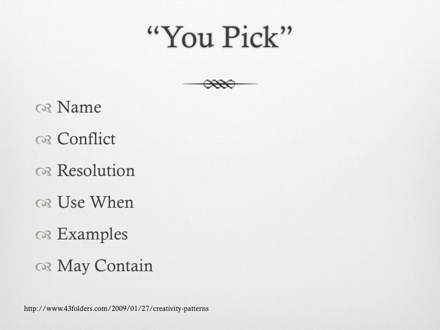 I am not suggesting that administrators treat librarians as children and offer them only two choices in things. I am suggesting that librarians need to start talking about what are the successful design patterns we can all benefit from? In this day and age, is it really necessary for us all to subscribe to Arizona Highways or Nursing in the Philippines? Do we really need to OWN all this stuff or would ACCESS to most of it be good enough? How can we harness what is unique about our individual collections to serve our library’s individual missions? How can we cut costs so we can focus on the things that really matter? The idea of a core collection is a dead horse in the electronic age. What is currently the proper way for us to assess our collections and move forward to the advantage of those we serve? As I said earlier, I don’t have any answers to any of these questions. I’m not even sure if those are the right questions. I don’t know what the proper design patterns are. However, people much smarter than me have spent a lot of time thinking about the proper design patterns for creative work, so I want to spend my remaining time discussing what some of those design patterns are. I am reading an interesting book by Twyla Tharp called “The Creative Habit: Learn it and Use it for Life.” Twyla is a well-known choreographer and has worked with the world’s largest and most renowned dance companies. 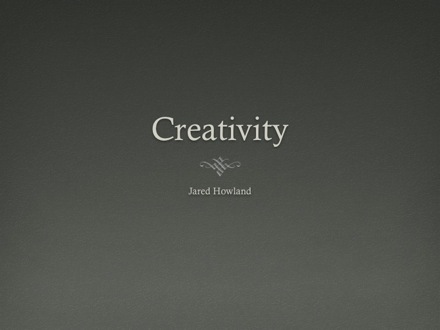 Placing both the word creative and the word habit in the title of her book, seemed to me to be be a bit incongruous at first. When I think of creativity, I think of freewheeling, free-flowing ideas and thoughts. When I think of a habit, I think of rigid, structured and pre-configured ideas and plans. Twyla states that to many people, creative work seems like a magic trick. An artist sits in front of a blank canvas and proceeds to create something out of nothing. A choreographer enters a virtually empty room and leaves with movements for a group of dancers. Creative work only seems like a magic trick to people who don’t understand that it’s ultimately still work. You must make it a habit if you want to be creative. 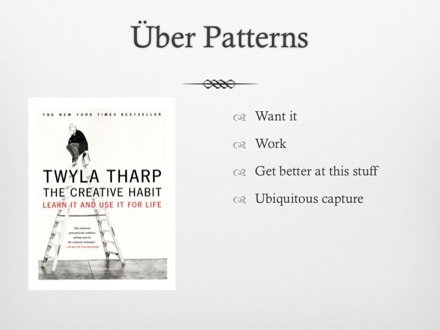 There is one more über pattern that I’d like to share and I believe it is the most important one. 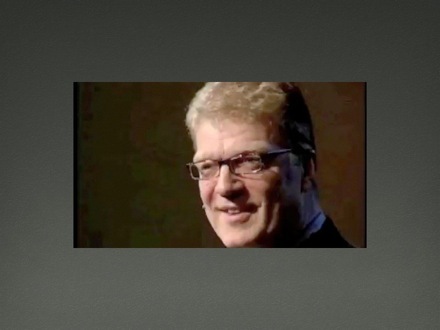 This presentation is about fostering creativity, and though I’ve provided some design patterns for creativity, those are more personal patterns that cannot be enforced on others. However, this last pattern is one that I believe can be and should be in use at all libraries. Creative ideas are not just created as fully-functioning, brilliant thoughts. They are born of hard work and from the ideas that did not go so well. Or in other words, creativity is a process and the two key components of that process are hard work and a willingness to make mistakes. We must be prepared to make mistakes if we are to be creative. If we hope to foster creativity in others, we must be prepared to accept their mistakes as well. I think I have time for one quick example of learning to accept failure before Bill talks about some of this in a bit more detail. Like many libraries, the process for getting projects approved and implemented is a tedious one here at the Harold B. Lee Library. It is a very rigid structure that attempts to ensure all projects are successful before they are even given the green light. Some projects, however, cannot have a known outcome or have a known success or failure rate. In the past, these projects were just denied. However, the library recognized that this was not an ideal situation and created a group that takes on these projects. Instead of creating a committee to study the feasibility of something, this group, call the Blue Sky Group, just works on and implements these projects. Some of these work and are released while some of them fail badly and never see the light of day. The point is, the failure is tolerated and actually welcomed by this group. 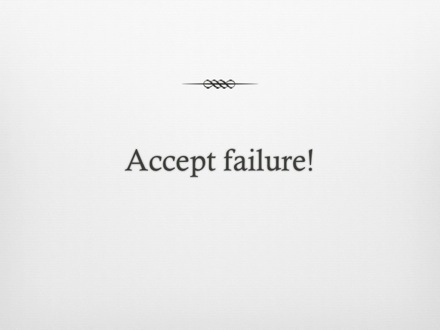 It is an opportunity to learn what went wrong and how to improve things for the next project that comes along. In short, being prepared to fail is the first step to coming up with solutions that will hopefully help us gracefully dismount our dead horses. Thank you!